They've both been banged-up, they've been frustrated, their supporting casts not carrying the load of some of the great teammates of the past, and if last night's Cavaliers win over the Lakers brought out the best in Kobe Bryant and LeBron James, the whole thing had the melancholy tinge of a World War II reunion; poignant because the exigencies of time dictate that this be one of their last. "Now I am (more appreciative of those moments)," Bryant said. "It would be a little different if we were contending for a championship. I would be my more moody self. "Now I have a little more perspective knowing I won't have a chance to play against him on the court for much longer. You want to enjoy it." It was hard to watch this, as a fan, without feeling your own mortality a little bit. Kobe was once a kid, a precocious, awkward world-beater who turned into a surly elder before our eyes. But he's been old, and breaking down, long enough for us to come to grips with that—he's just two years younger than the NBA's oldest player, and he's got the extra miles from jumping straight from high school. LeBron's transition to weary veteran is harder to grasp—he's my age, for goodness' sake!—yet it's happening whether you want it or not. For all the smiles last night, the occasion clearly had Bryant thinking about the end, whenever that comes. The catalyst was Byron Scott acknowledging that if the Lakers are this far out of it come March or so, he'd have no qualms about shutting Kobe down for the season. "I think he understands he's still a hell of a basketball player," Scott said, "but he's not what he used to be." Bryant knows it. He doesn't like it, but he knows it. He said that he'll sit when asked, and wrap up his season early if necessary. Because he gets that you can only borrow a finite amount of time. When asked about management's position in terms of him missing games, Bryant said, "Save these steps as much as possible. If my knees are a little sore, if my Achilles is tight ..."
But save those steps for what? "To try and get another year out of me," Bryant said, laughing. "Probably. You know me, man. If I say that's it, that's it." Bryant said if his final NBA season involved him sitting out games and playing with a minutes limit, he would do it. "I'll do whatever's necessary," Bryant said. He's already on a minutes limit, and he's already taking games off. (He'll sit tonight, the second of back-to-back nights. Bryant's playfulness was that of a Friday-afternoon employee, slightly giddy in the knowledge that there's no work the next day.) This is how it goes. You do one thing, and you do it better than just about anyone, but then you can't do it as well, and you can't do it as often, and eventually you can't do it at all. It's happening to Bryant, it's going to happen to James, and it'll happen to us all. 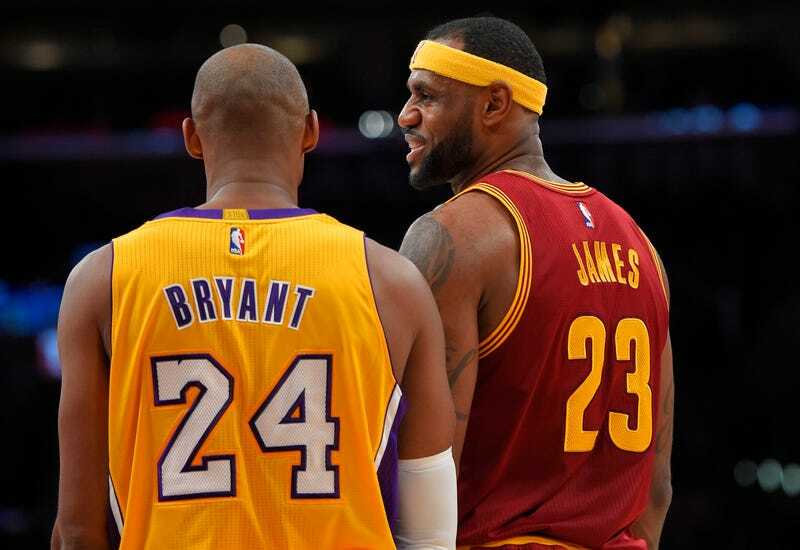 The best any of us can do is exactly what Kobe and LeBron did last night: delight in what you can still do while you can.